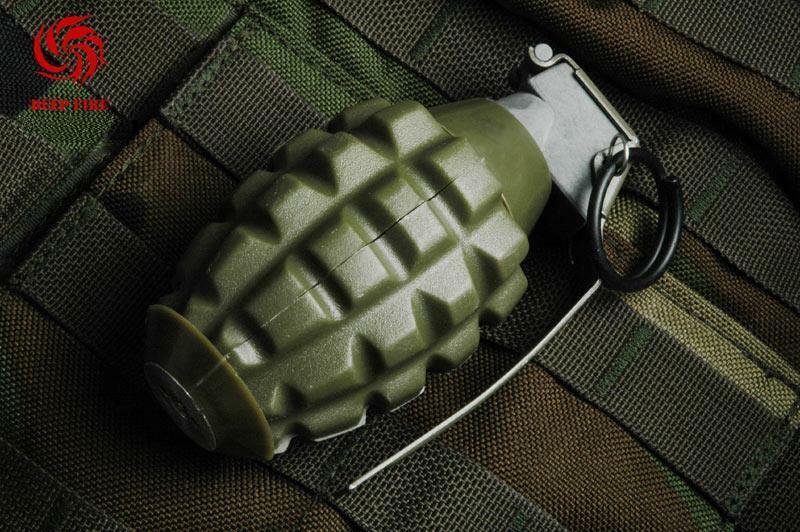 Deepfire MK2 and MK26 reusable gas fired grenade…. 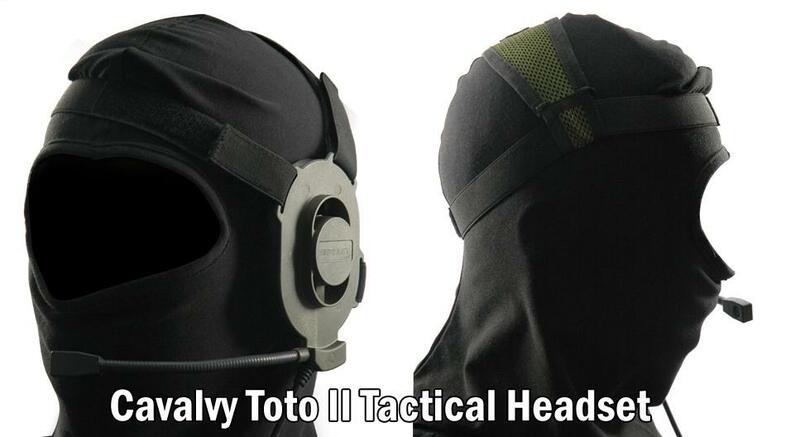 TOTO II Tactical Headset, is a close replica of the SELEX Personal Role Radio (PRR) as used by the British Army and NATO Forces..
Now available with conversion to most radio systems. Check out the Airsoft Skirmish website for details or phone 0776 4587410. As a user of the Cavalvy headset, I can personally recommend them to anyone wanting a reasonably priced Bowman-style headset. If you want one, act quick – they went down a storm at other retailers on release! Just a quick note to let you know about our new club and website, www.spartan-milsim.co.uk. Your readers may find our kit list and associated reviews helpful. The Spartan Milsim Club is a non-profit club that has access to a large part of Clocaenog forest, near Ruthin in North Wales. We run regular games based on a fictional counterinsurgency campaign in Dherkistan. Many of our members are ex-forces and are more than willing to share their experiences and expertise with those looking to improve their fieldcraft. If you or your team is interested then please contact Jon or Martin. 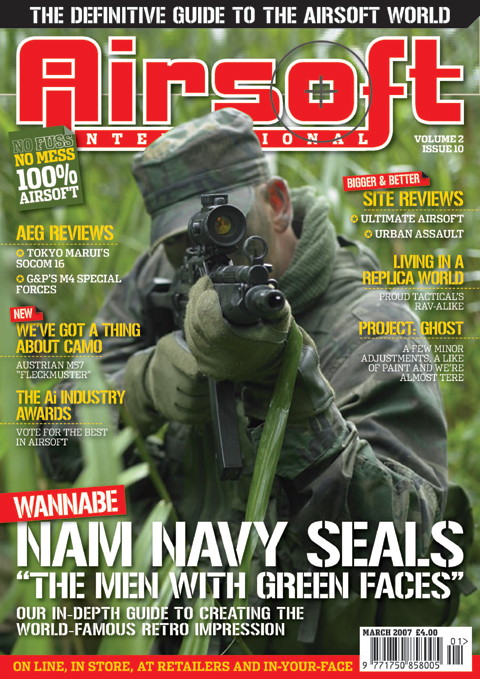 Airsoft International March 2007 Volume 2 Issue 10 In stock! A large shipment of the brand new Airsoft International March 2007 Volume 2 Issue 10 has just arrived with us today! So to be the first to get this brand new issue grab your copy today! At just £4.00 a copy and with postage just £1.00 using Royal Mail 2nd Class Standard and only £1.15 using Royal Mail 1st Class Standard it’s great value! * On the Spot: My Site Won’t Register Players. Why? * The Good Gig Guide: The Essential Guide to the Best Sites in the UK! * Things That Make You Go Mmmm! 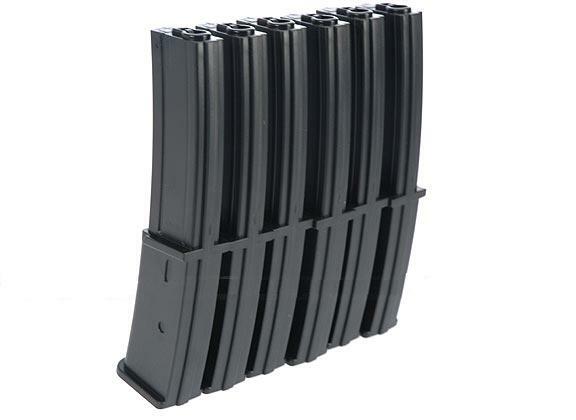 The magazine is listed in our Online store, direct product link: http://www.airsoft-direct.co.uk/product.php?cat=1002&subcat=185&product=622. As many of you may know Tanaka had dropped their adjustable bolt system on the M700 range of rifles following the new below 1 joule Japanese limit, and the latest rifles were coming without an adjuster and the appropriate parts missing and blanked. We are please to say that after asking our Japanese agent to lobby Tanaka they have reported to us today that “After hard negotiation with Tanaka and public safety commission about “exporting” the original gun called “Export Version” an unrestricted Gas rifles which non-relating to a new Japanese toy gun regulation “1-joule restriction” it will be ended soon so that we can offer you an original powerful gas gun as before pretty soon I hope. If Tanaka do hold to this, its great news, it would have been a great shame to have lost the adjustable bolt, as we think its one of the main sales point of the Tanaka, and an extremely useful option for countries with variable maximum powers on Sniper Rifles often from one Game site to another. 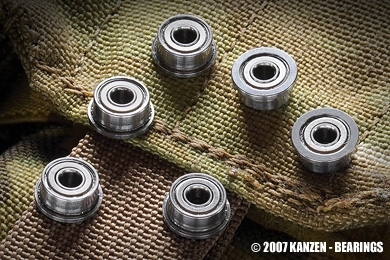 We, at KANZEN, are proud to announce the release of two new 8mm Bearings Kits, including the Ceramic reinforced SERIES-L, as a World Premiere. In the mean time, and due to the success of KANZEN Bearings around the World, we are glad to offer an important discount on all our Products from February 25th to July 1st. Also, we are holding an event there in the next comming weeks. It would be helpful if you could post this event information ASAP. here is a description of the event. When you enter the facility, we are on the right walking down the stairs, we will have an Airsoft banner up, and there is a pull down security garage door as well that is well noticable. $30 for the 4 hour session, you must pay at the field, at the moment we are only accepting cash. if you want to play from 4-8 for force on force after the scenario it is another $30. Fully sealed ANSI approved goggles + balaclava if you are over 18. The scenario will consist of Hostage rescue, and hostage take. It will consist of 2 teams that will switch every round. The other team that is rescuing the hostage will line up outside the entry door, then enter the facility and rescue the hostage, if the hostage is hit by the entry team they will lose points. The rescue team MUST take the hostage back and out of the door in order to get points. They’re will be a 5 minute time for each round, after every 2 rounds they’re will be a short ammo-resupply time. After 3 minutes the team attacking as the terrorist team will have the option to kill the hostage and win the round, but if they hold him for the total 5 minutes without killing him they will recieve more poiints. They’re MIGHT be one of our CQB instructors on the scene and if he sees one of the teams using the right entry or defending tactics he might add brownie points (nothing over 2 points each round). But this is not 100% confirmed, we are not sure if we will have a CQB instructor on the scene. The winning team will be announced at 4. I just get a piece of Inokatsu AK47S. After that, “The Evil Twins” finally completed. 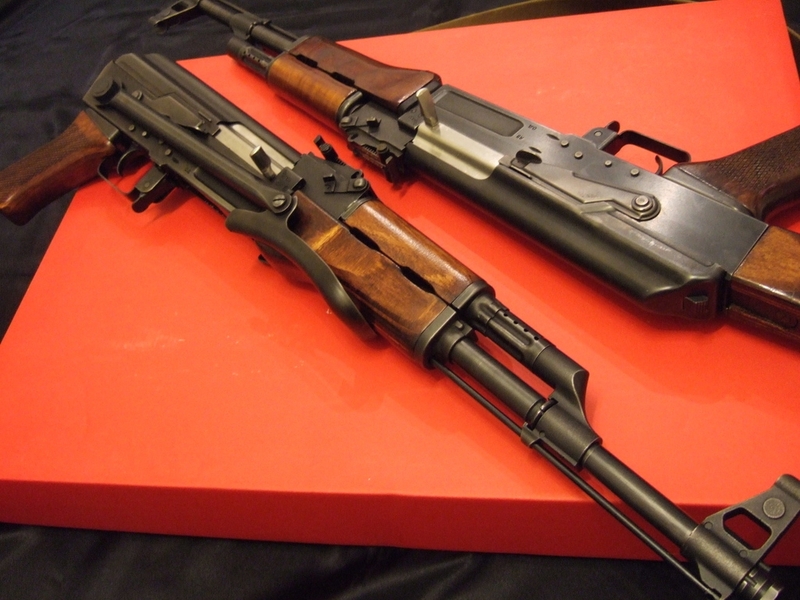 The major different between this kit and the TM or other brand name AK47S is that, it is again, made of full steel. See the below picture, the reflective surface texture can only be done by steel. To complete this evil, you need to install with TM AK47S. The parts you need are the gearbox, the folding stock hinge and the button. Nice build as usual. I still have 1 pcs in stock. After that, no one knows when it will come again. I am selling it at $750 for the conversion kit. You cannot get them anywhere in this price and most of the retailers are already out of stock. Hope you enjoy my offer about these kits. Contact me at ieting@Yahoo.com.hk for details, paypal accepted. US APSA Event this Weekend! Just received another update on this weeks HUGE APSA event that’s running this weekend near Pomona, California. A lot of really cool prizes going up for grabs both for competitors and also in the raffle that will be held during the event! Just wanted to drop by with a friendly reminder that we are hosting our big US APSA exhibition this weekend at Expo Airsoft. If you happen to be in the vicinity of Pomona, CA this weekend, come by and check us out! In addition to our big retailers’ challenge, we will be having open shoots for spectators and will be giving away both raffle and skill-based prizes to many lucky entrants! Don’t miss out on the excitement, prizes, and challenge of shooting one of our courses. Pre-register for the event on our website at www.usapsa.org. We hope to see you there! As the tide of war changes and Hitler’s forces are forced to retreat back to the Fatherland. Monty has a plan that could end the war by Christmas. A daring attack deep into enemy territory. This will be the largest airborne assault in history. Will you be one of the Axis defenders, desperately trying to re-organise in front of this totally unexpected tactic. 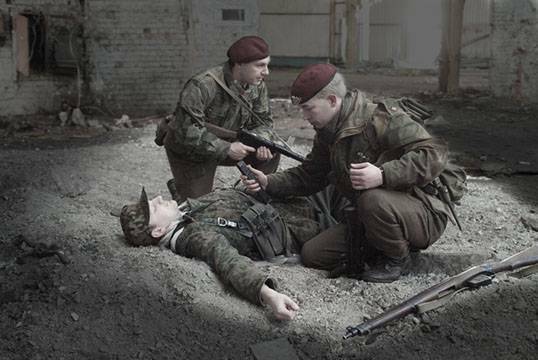 Or will you be a courageous member of the British airborne forces trying to defend your hold in a town completely surrounded by the enemy, running out of supplies and out of time. Or will you be a local Dutch resistance worker, fighting to kick the Axis invaders out of your home town? Don’t worry if you don’t have a WWII loadout or AEG, we’ve compiled a special guide that allows you to construct a ‘good for gaming’ WWII outfit for your chosen side for less than the cost of a couple of hi-caps! And you don’t need to necessarily have a WWII AEG, we’ll supply you with a list of ‘counts as’ AEGs. 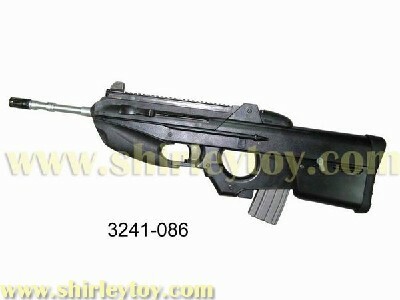 For example your M14 can represent a Browning BAR automatic rife or an M249 might represent a German MG42 machine gun. We’re staging this battle at Phoenix Airsoft’s excellent Urban site in Clay Cross, Derbyshire. We believe the ruined factory buildings and palatial hotel building will bring the real feel of wartime Arnhem to life and is a central location for most UK airsofters to reach. The event will take place on Sunday the 22nd April 2007. The group has a history of running successful events at other sites so this will be unmissable for any WW2 geardoes out there. For more information visit their website and forum at the Comrades in Arms website. We would like to invite you guys in participating in our very own Airsoft Magazine called ” AirsoftXtreme Magazine” asia’s premier airsoft magazine. 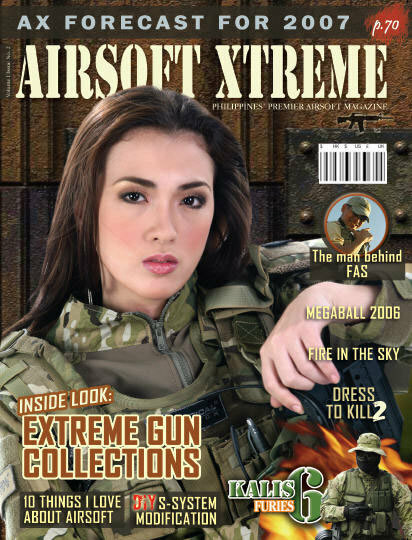 We just launched the first maiden issue last october of 2006 and it was highly appreciated by airsofters here and abroad. Here’s the 2nd issue of Airsoftxtreme Magazine. We are also happy to announce that Airsoft Xtreme is currently being sold at Echigoya, Japan. Redwolf International is already promoting and distributing the magazine all over HK as well as in U.K.
Another Airsofting magazine in English can only be a good thing for all western airsofters who struggle with the finer points of kanji. Here’s hoping it can bring something new to airsofting! Just to let you all know the SSL certificate problem has been fixed (it’s only taken them since december to resolve it >:o ! Also to let all your forum members know that after a long absence we’ve got our full range of pyrotechnics back in stock, plus a few new additions, including discounts on bulk orders. Interestingly, the model has some of the nice touches of the VFC SCAR, such as flippable sights, a folding and extending stock and a removable barrel / flash-hider, meaning this should be of interest to the SCAR fans out there. Take a look at Gunner Airsoft and see what else has been added! Just a quick message to say that due to ongoing instability, the Arnies Chatroom is moving from its current home on Xombo to the popular Quakenet network. For those of you who connect via the Java Client (accessible via the ‘Chatroom‘ link at any time), the client should automatically take you to the new home within the next 24 hours. All users using dedicated IRC clients will need to redirect their IRC clients to irc.quakenet.org, and channel #arniesairsoft. Anyone requiring additional help or info is advised to check the Chatroom FAQ thread. Yes folks, it’s the much-loved FN2000. Unfortunately at present all we’re able to confirm about Shirley Toy’s FN200 is that it will be an AEG, and that judging from the image, the item will be on the same level of build quality as recent CYMA offerings. If anyone has any more information on the rifle, please feel free to let everyone know either here or on the forums. Thanks! Real Sword – Chinese Rifles Company! 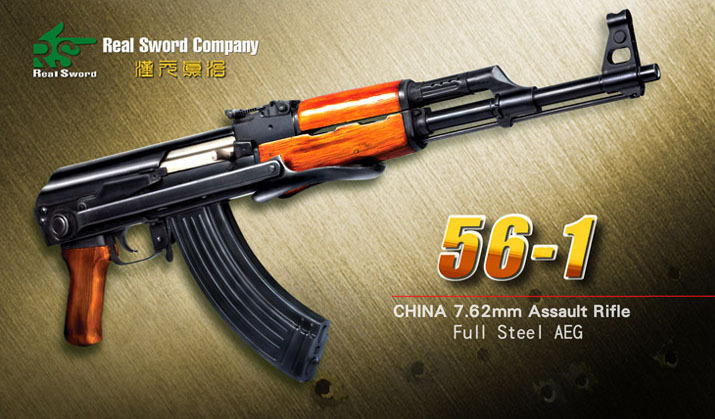 Okay, so I admit I’ve been a little slow off the mark with this one (especially since I’ve known about this for a week now), but a new Chinese Airsoft manufacturer by the name of Real Sword have popped up on the radar. You may notice that a lot of these rifles have a high steel content. This is because quite a lot of the components appear to be actual real steel components. It is rumoured (and I emphasise the word rumoured at the moment) that Real Sword is a a division of a certain well known Chinese defence contractor who shall remain unamed for now, but if there is in any truth in this then I think we can look to expect great quality to the exteriors of Real Sword aegs in the upcoming months. The bad news however is that Darklite and Billymak visited Airsoft Heaven (aka Kwong Wa Street in Hong Kong) yesterday, and despite asking around, none of the major retailers (including specialists such as Gunner Airsoft) had heard of Real Sword. Further bad news: one of these retailers stated that if, as we suspect, these rifles have a high steel (and indeed, real steel) content, that retail prices can be expected to be around the price of a Classic Army rifle. 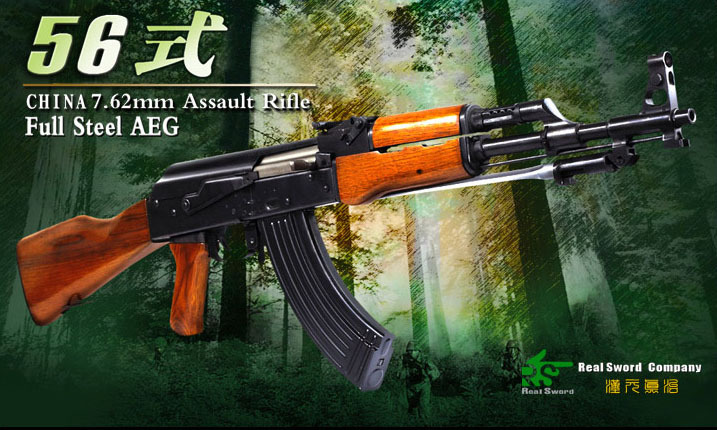 Regardless, it appears the days of Chinese rifles as just cheap imitations may be numbered!